The Only Supermoon of 2017 Is Tonight. Here’s How to Photograph It. If you keep tabs on celestial happenings, then you probably already know that the moon is putting on one hell of show tonight. It’s a supermoon, which means everyone’s favorite big white orb overhead is going to appear bigger and brighter than usual. In fact, it will look 14% bigger and 30% brighter, because -- in true supermoon fashion -- it’s both full and near its perigee, or the point at which it’s closest to Earth in its elliptical orbit around us. It will be a sight to behold in the moment, but you'll of course want to snap some pics. So, to ensure you don’t end up with some blurry garbage unworthy of your Instagram #brand, here are some tips on photographing tonight’s big spectacle in the sky. Fingers crossed the clouds part wherever you are. 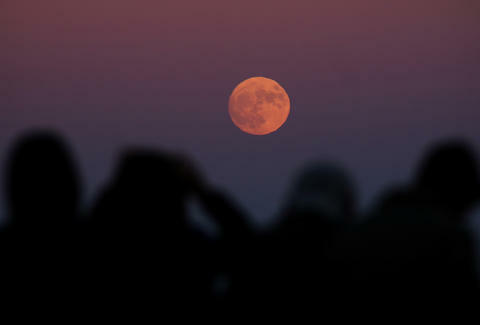 The best time to see and capture the supermoon is just after it rises or just as it’s setting, so figure out when that will happen where you are, where it’ll be located in the sky, and scout out a clear viewing spot. Although the moon will technically appear the same size at any position in the sky, getting a landscape reference point like a building, tree, or mountain in the frame not only makes your photo more interesting, but creates the illusion that the moon is much bigger, even though it’s not. If you’re using your phone’s camera, using digital zoom will diminish the quality of the photo. Instead, use your optical lens (or on an iPhone 7 Plus or higher, the 2x optical zoom if you’d like) to frame the shot you want, then worry about cropping it later. Although shooting in low light typically requires a long exposure, you’ll want to shoot the moon just as you would an object during daylight. That’s because if you leave the shutter open for too long, you won’t be able to capture the interesting detail of the moon’s surface, and instead will just get an bright orb. For a crystal clear snap, you’ll want to keep your camera/phone super stabilized. If you don’t have access to a tripod, find a solid surface to rest your camera on, and shoot using a timer. If there’s no surface in sight and you must shoot with your camera in-hand, there's a trick to use your body as a tripod and reduce accidental body shaking or movement when you snap the pic: hold your breath, hoisting your camera in position with your elbows firm against your sides, then tap the shutter. If weather in your area turns out to be a total bummer and you miss seeing the true supermoon tonight due to the clouds, it will still look larger and brighter tomorrow, and appear to be “full” (although it won’t technically be a supermoon). So, you could try to get some good shots then, instead.